A new era of orthopedic surgery is taking shape at Peking University. Armed with an Electron Beam Melting (EBM) 3D printer, doctors are able to create titanium implants that fit perfectly with a patient’s body. 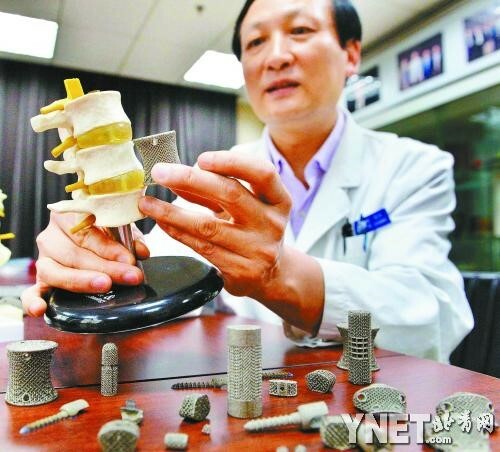 Over the course of the last four years, Dr. Liu Zhongjun has been using EBM 3D printing to develop new spinal implants. During that time he’s created dozens of orthopedic implants each of which has been custom designed to fit each patient’s body. “We started clinical trials on 3D printed implants late last year, and now we have used dozens of such implants for more than 50 patients," said Liu. In fact, according to Liu “"All the [implant] patients recover very well. Nobody seems to have any undesirable side effects or adverse reaction." Since working with 3D printers Liu has been impressed with the technology’s abilities. "3D printing technology has two very nice features: 1. It can print specific structures; 2. It is capable of producing porous metal." Liu explained. While short run customization is the chief benefit, Liu has noticed another benefit that sets 3D printing apart from other implant manufacturing techniques. "In the past we used clinical titanium mesh, but with the growth of bone, titanium mesh could easily stick into the bone and cause collapse. 3D printed implants fit the bone completely. And as a result, not only the pressure on the bone is reduced, but it also allows the bone to grow into the implants." Liu continued, “In this aspect, 3-D printed implants are more reliable than traditional ones,"
In the coming months Liu expects to receive approval for his titanium implants from the Chinese health authorities. Once he’s received approval wide spread use of the implants will be available throughout China. Follow me @KyleCMaxey and join the 3D Printing discussion.